Circular Drives are very popular but many homeowner do not know what to do with the inside circle. GroundScape designed a beautiful landscape that is also functional. 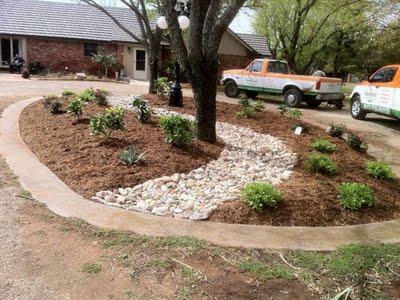 What was once just a circle drive with dirt in the middle becomes the center piece for your front yard landscape. If you have trees in the center of your circular drive, the landscape and border around the trees insures that no one will drive over the large root system of the tree. Countless trees are killed every year do to compacted soil over the root systems of trees.